GP Machine Tech is committed to quality. Our systems and processes are driven by our customers' requirements and expectations. And though our customers cover a wide spectrum of industries and requirements, they all share the need for quality products – products they have found at GP Machine Tech. Our products are delivered in a timely manner at a competitive price. We provide a full range of inspection and testing services, sample plans, certificates of compliance, and mil-certification/documentation. Our quality system allows all of our employees to access relevant project data through GP's company-wide information system. Access includes job scheduling and tracking, work instructions, quality control plans and reports. 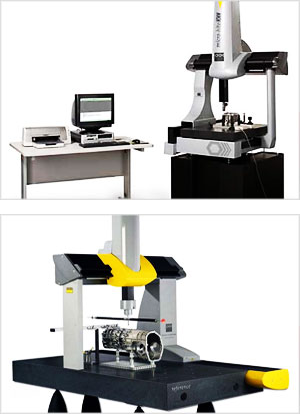 GP Machine Tech uses sophisticated Coordinate Measurement Machine (CMM) to provide precise measurements of the part within the tightest manufacturing tolerances. The CMM checks geometric dimensions and tolerances specified on the blueprint. The result? A quality part that's on spec every time. Our management and employees are commited to exceed customer satisfaction with products that meet applicable requirements thru the continuous process improvement.